The GoodFriend Tenant Protection Plan covers fire, vandalism, theft, smoke, water damage, lightning, and explosion. 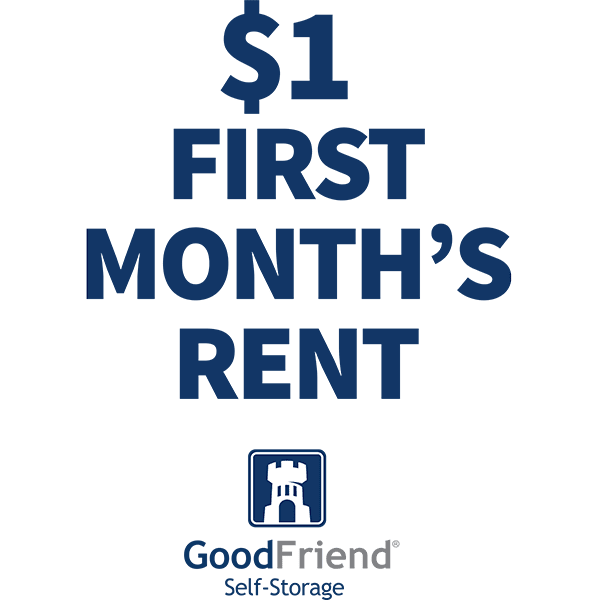 As a GoodFriend Self Storage tenant, you are eligible to enroll in this program. We offer two levels of coverage, up to $2,500 for $10/mo and up to $5,000 for $20/mo. 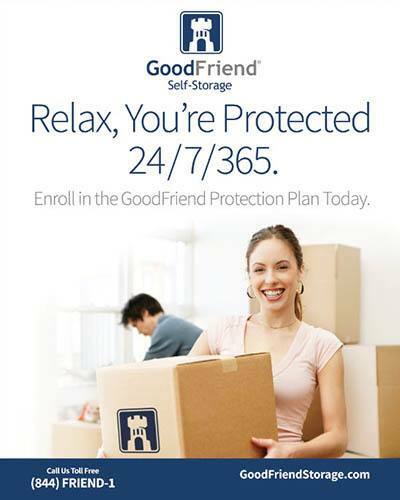 For more information about the protection plan that is right for you please call us at 844-374-3631 or visit a GoodFriend Self Storage store near you. GoodFriend Self Storage provides online options to manage your account. From paying your bill to checking balances, our online account service makes managing your storage rental hassle-free. You can even sign up for auto-pay to take the worry out monthly billing. At GoodFriend Self Storage we look to make storage easy. If you have any questions about our online account options please speak to one of our self storage staff members and they will be happy to assist you. Click here or call for more information! Our self storage facilities are equipped with a variety of features to provide you with the most convenient storage experience possible. Climate-controlled storage units, interior loading areas, loading dock platforms and access seven days a week are just some of the highlights of our facilities. Please call for more details about our current specials! GoodFriend Self Storage offers you everything you need to store your belongings with ease. Contact us to learn more about our self storage features.